Renato Moicano is a rising star in the UFC’s featherweight division. He’s been with the UFC since 2014 and has gone 5-1 during that time with his only loss coming against Brian Ortega. 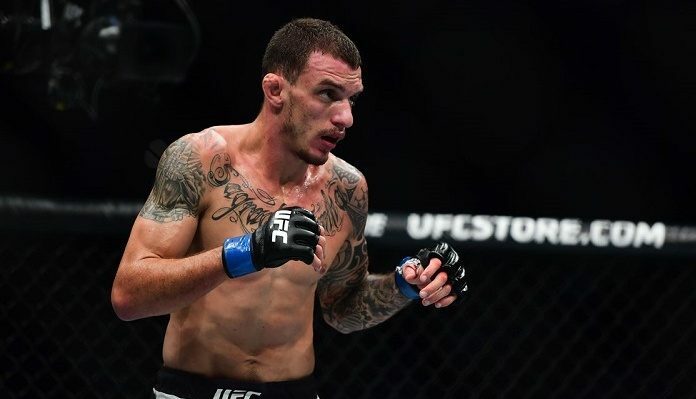 Since the loss to Ortega, Moicano defeated Calvin Kattar and Cub Swanson to then become the backup fighter for the UFC 231 main event. Moicano ended up not having to fight as Max Holloway and Ortega both made weight. However, being the backup fighter showed he was the number one contender at featherweight, and he has to prove that when he takes on Jose Aldo at UFC Fortaleza. If Moicano does indeed come out on top, he believes he will be getting the next title shot. Although Moicano is confident a win gets him a title shot, he is not looking past Aldo. He knows Aldo is a tough competitor and that he will need to be at his best to get a win. No matter how the action unfolds, Renato Moicano thinks this will be a fun fight for the fans in Brazil and those watching at home. For Moicano, it is cool to be fighting a legend of the sport in Aldo. However, he wishes this fight was the card’s main event. Although cardio is not a worry, he would prefer to show fans he can go all five rounds so there aren’t questions surrounding him when he gets a title shot. Although Moicano is not fighting in the main event, he is fighting in his home country of Brazil, which he considers an honor. Ultimately, come February 2, Moicano will be ready to take on the former champion in Aldo. His confidence is high and knows the stakes are high as well. “This is my time. This is my chance to prove I’m a real contender. After this fight, I’m coming for the belt,” he concluded. Do you think Renato Moicano will beat Jose Aldo on February 2?